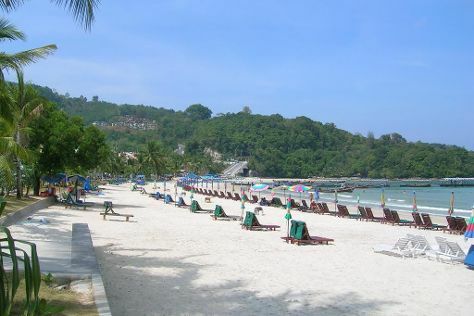 Take advantage of nighttime entertainment and daytime relaxation on a Patong vacation. This beach resort town is famous for its hedonistic nightlife and draws a mostly Western crowd of tourists, its tour companies, international restaurants, and souvenir shops catering to the booming tourism sector. The local beach offers a wealth of activities, from water sports and beach barbecues, to obligatory soaking up the sun on the soft sand. At night, the town's main strip turns it up a notch, with clubs and bars serving inexpensive drinks to revelers from across the globe. Quiet areas of town do exist, but they are few and very far between. Patong is in Kathu. Plan a trip to Thailand easily and quickly by telling Inspirock to suggest an itinerary.